It’s no secret that baby #3 was a surprise for us… for a couple reasons really. One, I didn’t realize after baby #2 that I’d want any more children. Two, once we were both on board with having another one, neither of us thought it would happen as quickly as it did. The problem was my husband was no longer working, and we’d already given away nearly all of our baby stash. A single income family on a tight budget, we had to find creative ways to save money when you have a baby in the house again. One of the biggest expenses we encountered when planning for baby #3 was the crib. Thinking we were done having kids after baby #2, we actually gave our crib away. Considering the price of brand new cribs and the potential dangers of buying one used, we opted instead for a playpen. There ended up being several really great benefits to that decision! It cost us less than $100! See my recommendations. A quick insert change took it from newborn depth to toddler-safe depth in less than 5 seconds as baby got older. The bed goes with us wherever we go, meaning baby never feels like she’s sleeping somewhere new. No gaps between rails means no wiggly arms or legs get stuck in the middle of the night. I know some moms who swore their changing tables were a waste of money, but mine was invaluable. With my first, it was a hand-me-down that didn’t survive our first move, but it was essential to my sanity (and my back). I had one place to change the baby where I kept all my supplies within arm’s reach and only one place to clean when the inevitable diaper explosion happened. I also loved not having to bend over to change diapers or fight a wiggly infant on the floor! When baby #2 came along, I went to the craft store and grabbed a pack of velcro and a cheap wicker storage basket. I used the velcro to secure a contoured changing pad to the top of the baby’s dresser. It left just enough room for my wicker basket where I keep a stash of diapers, baby lotion, wipes, and diaper cream. Thrift stores are amazing places to find kids’ toys and just one more of the many ways to save money when you have a baby. They are typically in great shape, minus a few naked dolls, and baby toys are usually almost brand new! I stocked up on rattles, lovies, and development toys for early infancy—just make sure to wipe down hard toys with a bleach-water solution and throw soft toys in the washer and dryer once you get home. There are two big ways we saved big on baby clothes for our third baby. First, I bought lots of clothing on eBay. This is a great option if you really don’t care what the outfits look like—you’ll save big, but by nature, most lots will contain a few cute outfits and a handful of throwaways no one really wants anymore. My favorite was actually shopping on Amazon for the Simple Joys line by Carter’s. Each pack of clothing contains 3-5 pairs of onesies, pants, or tops. They aren’t as high quality as the Carter’s you’ll find elsewhere, but they are super budget friendly and still held up well to the daily rigors of life as a baby/toddler. We’re even able to recycle them for—wait for it—baby #4! I was only able to breastfeed my kids for anywhere between 2 and 9 months with each. Still a huge accomplishment for me, but it gave me some insight on getting thrifty with feeding my kids from a young age. First, I invested in a hospital-grade breastpump that actually didn’t cost me an arm and a leg. You can read more about my breastfeeding setup here. I breastfed my babies as long as I could and pumped/froze milk for those times when I needed or wanted a break from being the baby buffet. For formula, I purchased the store brand version of Enfamil Gentlease. Typically, companies will advertise this connection with phrases like, “Compare to…” I used to purchase name-brand only (and at exorbitant prices) until my pediatrician said that all formulas have to meet minimum nutritional standards set by the FDA and are virtually the same. According to our doc, most extra fancy things (not specialty formulas like lactose-free) they add are more closely tied to marketing than peer-reviewed research. Amazon is this mom’s lifesaver! I use PrimeNow in a pinch on the regular, and I look for sales on household goods. Once, I was able to snag 10 containers of laundry detergent for $1 each! One of my favorite ways to save money when you have a baby is to buy diapers and wipes in bulk from Amazon. The diapers are pretty close to Huggies (not quite as thick but pretty absorbent), and I really love the wipes. Check out the diapers here. Our bulk wipes are here. Bulk diaper cream is here. Companies are really tuning into the needs of busy parents on a budget. 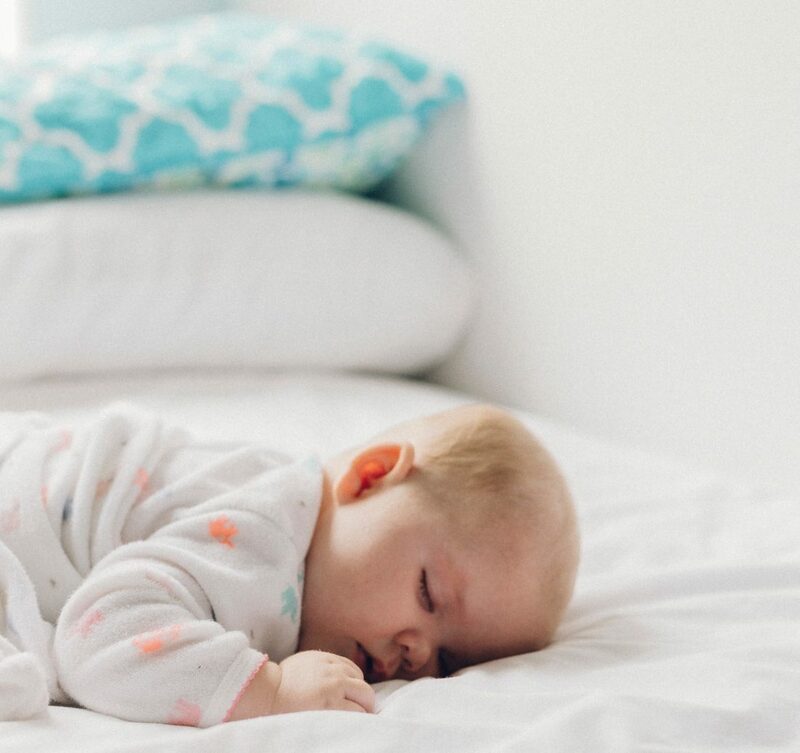 Companies like Simply Bedtime offer monthly subscriptions that deliver a month’s worth of baby supplies. By subscribing, you can get bedtime baby wash, calming baby lotion, and natural diaper cream (plus a bonus bedtime book) every month for half of what it sells for retail. The best part? It’s automatically delivered, so you can subscribe and never have to think about it again. Enter to win a year of free boxes from Simply Bedtime! These are such great tips for new mamas to be! I never understood why people start planning an expensive nursery so early on. We co-slept with both of our boys so the crib we bought for our first never got used hahah. This is such an important topic. It is.not neccessary to spend money on our babies stuff. Instead, we should invest more with their health and soon th education. We can save more money if we buy things that are only needed. You playpen idea is utter genius! That and the suggestion of using a dresser alone will save significant amounts of money. I’m definitely going to suggest this for all my mommy friends. There is such pressure to buy lots of new fangled gadgets but I always changed the baby on the bed – just as easy and just the right height. So many smart ideas for new parents! I know a couple new parents, and I think that ditching the crib would help to save so much room! Ooooo so many great tips!!!! A new baby definitely can get pretty costly!! Every little bit really does help! Buying clothing lots was very helpful for us, as was reselling ours in turn as we were able to do so. We never tried Amazon diapers but always been curious. Helpful to know you’ve had a good experience with them. I love these different ideas for saving on a baby. Having a baby can definitely add up fast! Thanks for sharing these this. I’m yet to be a mother but I’ll rather do all of these and save more than luxurise everything. Even my dressing table houses something else now. Lol. I can see where second hand and discount clothing would be the way to go. Babies just outgrow clothing anyway, so there’s no need to buy everything brand new. So true! Second-hand baby clothing almost always looks brand new, though sometimes you can snag some really great deals at Carter’s or Target that rival even second-hand clothes. I’m a big fan of saving money. Babies are so expensive because they grow out of everything. When our boys were little, we bought all their clothes from eBay and thrift stores. These are really great tips! Re-using furniture is a really good idea and so it the subscription. I didn’t realize that those existed!! The monthly subscription to baby supplies sounds awesome. I never knew that Amazon sold diapers. Wow! What don’t they sell? These are such great ideas. I love upcycling to make new use of old items. These are excellent! These are such great tips for new moms and those expecting. Always good to know some money saving tips!